They gathered at the beach, lakes, parks, rivers and creeks with a mission of picking up trash and to bring back the natural beauty. 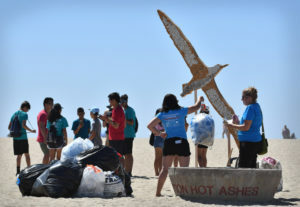 Thousands of volunteers showed up and down the coast on Saturday September 15 for the annual Coastal Clean up day organized by the Coastal Commission. This event first got started in 1985 and has grown to be a world-wide effort. The efforts have spread to inland efforts as people have become more aware the much of the pollution starts in in our own neighborhoods from the trash on the streets far from the ocean. In mission Viejo residents gathered of clean up Oso Creek. Cigarette butts top the list of items picked up during beach clean ups. From 1988 to 2016, an estimated 7.3 million butts were picked up, making up about 35 percent of the trash found over the years. In second place were food wrappers and containers — 2 million picked up, about 10 percent of the total. Make a difference and gather a group together for next years event. In the mean time you can make a difference every day by discarding your trash properly. Over 200 pounds of trash were weighed during the California Coastal Cleanup Day Saturday, September 15, 2018 in Huntington Beach. Two groups, Orange County Coast Keeper and Trail 4 All have a combined 40 cleanup sites in Orange County.